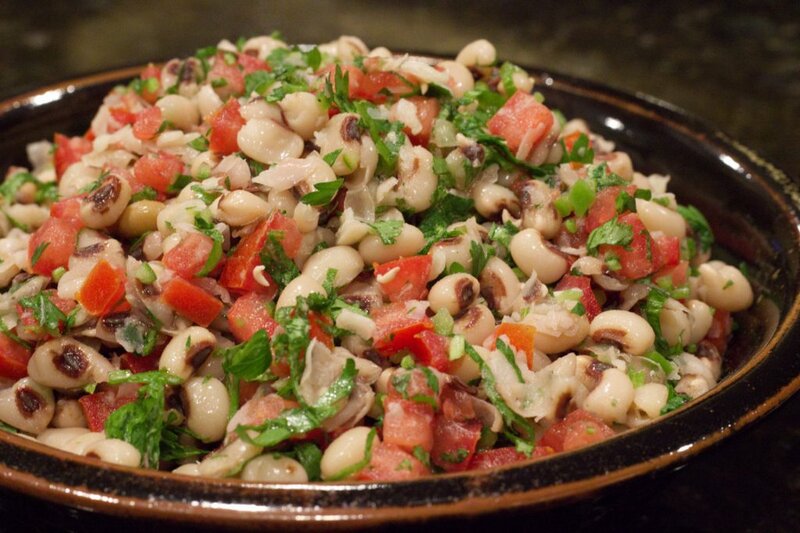 I made this Texas Caviar over 20 years ago and then lost the cookbook. Recently I came across it again. It would be a fantastic dish to serve at a party. Dried Black-eyed peas were hard for me to find in my local stores so I ordered the organic ones at Amazon. They’re a good source of nutrition for vegetarian and vegans. In a 2 to 3 quart pan, bring 1 quart water to a boil. Add peas; reduce heat, cover and simmer until tender (About 50 minutes). Drain, rinse well with cold water, and drain again. Transfer to a bowl and set aside. In a separate bowl place finely chopped tomatoes, chopped cilantro, and chilies. You can use a food processor to do this but don’t turn it to a puree. You still want it to have some texture. Add the white wine vinegar and lime juice. Add mixture to beans and season to taste with salt. Garnish with cilantro springs if desired and serve with Water-crisped tortilla chips or packaged tortilla chips.